I have two used (good condition) Jones Bars for sale. They have handlebar tape and no dents. $50/each - Also available for the bar is a Banana Hammock from Broad Fork Bags (retails $70) negotiable. 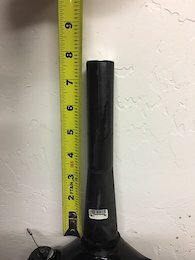 100mm 15x100 Remote Tapered Carbon 7-5/8" Steer, The fork has light use and looks almost new as depicted.